★ DESIGN - INSPIRED BY PARENTS - Made By Highest Quality Materials: 70% Rayon from bamboo, 30% Polyester. 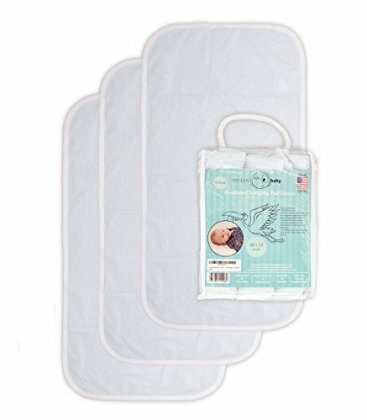 (26"x13") 3 Pack - Best size change pad cover for your growing baby. Bamboo terry cloth, is silky soft - pleasant to touch/gentle and good absorbent. We used premium waterproof and nontoxic TPU backing. ★ MACHINE WASHABLE & DRYER-FRIENDLY, ANTIBACTERIAL & HYPOALLERGENIC - Reusable and hassle-free. Throw the soiled ones in the washing machine in warm or cold water (up to 30 degrees) disinfection is not necessary because of bamboo natural antibacterial properties, tumble dry on only low setting and always have a fresh one ready. Do not dry clean, iron or use bleach. ★ TheSmilinBaby - changing table pad offer an added layer of protection to keep your changing station clean. Just place the liner on top of your changing pad, bed, or other changing surface to keep the mess to a minimum. One of modern baby gear every parent must have. ★ GET IT WITH CONFIDENCE: The Changing pad liners comes in a beautiful professional package that makes it one of the best shower gifts idea. 60 days money back, 100% satisfaction garuantee. Order yours today!